There are some great benefits to precious metals investments: continued demand, liquidity, hedge against inflation — just to name a few. When it comes to precious metals, you're bound to be most familiar with gold and silver and their investment benefits. However, other precious metals do exist, and they carry some great advantages. Of these unknown metals, there are a few that are poised for a breakout. One of these metals had a fantastic 2017, surging upward in price in the late summer. This metal is often overlooked because it doesn't share the same spotlight that gold and silver do but don't be fooled. This metal has been one of mankind's most crucial components to development for thousands of years. Like I mentioned earlier, copper is a precious metal like gold and silver. However, unlike those two precious metals, copper has more uses and a variety of industries rely on it every day. It’s the most versatile metal in existence. 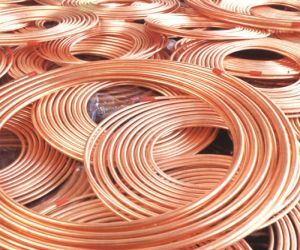 Because it's an efficient conductor of electricity, copper is used for heating, plumbing, roofing, computers, cars, mobile phones, air conditioning, adapters, wiring, electrical leads, motor and lighting units, and transformers. Copper has such a high commercial and industrial importance that you’ll never see its price fall to zero. Copper had been experiencing a bear market since 2011. But at the end of 2016, this bear market looked like it was finally coming to a close. After President Donald Trump won the election in 2016, speculation ran rampant over the new president’s $500 billion infrastructure plan and the resulting demand on metals — including copper. Over the course of 2017, Copper’s price ticked steadily upward, nearly doubling by the close of the year. When you invest in a commodity like copper, be aware of the factors that influence commodity prices. This includes political issues, the value of the U.S. dollar, investment fund speculation, and supply and demand of production. You should pay close attention to the U.S. dollar. Bullish moves for the dollar mean bearish moves for copper and vice versa. Keep this in mind when considering copper as an investment. The World Bank (WB) is projecting that copper prices will start rising to reach $6,187 in 2018, $6,257 in 2019, and $6,328 in 2020. In addition to those projections, Goldman Sachs lifted its 12-month copper price forecast to $7,050 per tonne. Goldman Sachs is expecting China to drive half of the global copper demand over the next five years. China will be adding to its current copper consumption with new technology in the smelting industry. Currently, China makes up 50% of the world’s copper demand. You've heard this before, and you're witnessing it right now: the increased demand for electric vehicles (EVs). Bloomberg is reporting- that sales of EVs will hit 41 million by 2040. The world is shifting toward becoming a “cleaner” and “greener” environment. This is a huge step forward that begins with EVs. EVs require three times more copper than a gasoline-powered car, which is great news for copper. While more electric vehicles flood the street, there will likely be a far greater demand for copper. Of course, there are risks involved in the copper market right now. But the benefits of an investment in copper could outweigh the risks. Southern Copper Corporation participates in mining, exploring, smelting, and refining copper in Peru, Mexico, Argentina, Chile, and Ecuador. It was one of the companies that we expected to do well in 2017, and we weren't disappointed. Over the course of 2017, Southern Copper’s stock price nearly doubled — moving up from the $20 range to over $50. That’s dynamic growth, but it doesn’t mean the company is done. Southern Copper could continue climbing if copper’s price increases, which it's expected to do. At the time of writing this report, Southern Copper has a market cap of over $37 billion and a P/E ratio of 31.97. In its third-quarter 2017 earnings, the company reported a net income of $401.8 million. This was 103% more than the same quarter in 2016. Earnings per share are $1.54 with a dividend yield of $1. The company continually works on expanding its copper production, regardless of any supply and demand imbalances. Founded in 1851 and headquartered in Melbourne, Australia, BHP Billiton Limited is one of the top producers of commodities like iron ore, metallurgical coal, copper, and uranium. It's not only focused on the metals market but also has interests in oil, gas, and energy coal. At the time of writing this report, BHP has a market cap of $129.62 billion and a P/E ratio of 21.80. In 2017, BHP turned to tackling its debt, which could free up company resources while copper demand increases. BHP Billiton has a manageable debt-to-equity ratio and has brought in a healthy cash flow — $3.68 billion — despite this past year’s low commodity prices. Freeport-McMoRan Inc. is the world’s largest publicly traded copper producer. Headquartered in Phoenix, Arizona, the company operates long-lived geographically diverse assets with ample reserves of copper, gold, molybdenum, cobalt, oil, and natural gas. This was another company that we highlighted in our 2017 copper outlook. Over the course of the year, Freeport’s market cap increased by nearly $10 billion. At the time of writing this report, the company has a market cap of $28.85 billion and a P/E ratio of 26.93. Freeport’s stock rallied over 30% in December 2017, which was likely set off by a positive outlook on copper for 2018 and increasing prices. In 2017, the copper market finally broke free of a slump that had lasted for over four years. That slump took its toll on many copper companies, including the copper miners we mentioned in this report. Even with the rise of copper in 2017, investors are still looking at a recovering market, fueled by increasing copper demand and prices. As we move into 2018, most market experts agree that China will heavily influence metal prices for the year. And market demand from China is expected to be high. Goldman Sachs is expecting the commodities sector to generate returns of almost 10% next year, which is more than other assets. Goldman Sach’s analysts are more bearish on aluminum and bullish on copper. This analyst belief lies in simple supply and demand. Aluminum is expected to be abundant in the coming years, whereas supplies of copper may become more constrained. This belief meshes well with the oncoming rush of electric cars, which will require copper for their batteries. Keep an eye on copper; it will be having a big year. Before we part, we'd like to extend a sincere thank-you for joining us at Wealth Daily. We look forward to providing you with valuable investment research and commentary during your subscription. Our core philosophy is that the more you know, the better you'll be able to take advantage of that knowledge to expand your wealth. We'll continue sharing our insights on how to boost your portfolio with flexible and safe investments.